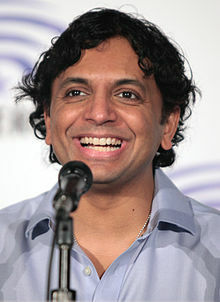 Manoj "M. Night" Shyamalan (born 6 August 1970) is an American film director, screenwriter, producer, an occasional actor kent for makkin movies wi contemporary supernaitural plots. His major films include the supernaitural thriller The Sixth Sense (1999), the superhero drama thriller Unbreakable (2000), the science feection thriller Signs (2002), the psychological thriller The Village (2004), the fantasy thriller Lady in the Water (2006), the naitural thriller The Happening (2008), the fantasy adventur film The Last Airbender (2010), the sci-fi action-adventure film After Earth (2013), the foind-footage horror film The Visit (2015) an the upcomin horror thriller film Split (2017). ↑ Huber, Robert; Wallace, Benjamin. The Philadelphia Reader. Temple University Press. p. 197. Then [Shyamalan] changed his name. The idea came when he was applying for American citizenship at age 18. This page wis last eeditit on 27 Dizember 2018, at 00:38.